Carmarthen Town AFC manager Tomi Morgan is expecting a tough game against Alliance leaders Gap Connah's Quay in the Welsh Cup today. Kick-off at Richmond Park is earlier than usual at 2pm. New Farmers' Union of Wales premises at Dolgellau livestock market have been officially opened by the union's president Gareth Vaughan following months of renovating and redecorating. The work also involved obtaining an electricity connection for light and a telephone connection with internet broadband facility so that the union's local area officers can access various insurance companies. "Establishing a secure unit for the FUW at the market is a great new development for the union's Meirionnydd branch," said Mr Vaughan. "It is easily accessible and no doubt will be extremely useful for FUW members and insurance policy holders who visit the market, especially as it has use of broadband internet." FUW director of business development Emyr James said: "The union is continuously striving to improve its services to members and an office at Dolgellau mart demonstrates this commitment. People who experience any problems on a bus service in the Ammanford area are being urged to contact the Traffic Commissioner. A number of complaints have been received regarding Veolia Transport which operates the 126, 127, 130, 145, 146 and 164 routes. The company no longer has a contract with Carmarthenshire County Council, but has continued operating without subsidy. This means that the council cannot take any action against the company if the service is not provided. Deputy Leader Cllr Kevin Madge has complained to the Traffic Commissioner after the matter was brought to his attention. Cllr Madge said: “These services are vital for people living in the Ammanford area, many older people rely on them to get out and about. “I have complained to the Traffic Commissioner, which is the regulatory body responsible for commercial bus services, after it was brought to my attention that a number of problems had been experienced with this operator. A Llandysul woman has been fined after being caught throwing a cigarette end in Carmarthen town centre. Louise Edith Davies, aged 37, of The Beeches in Llandysul, pleaded guilty to an offence contrary to Section 87 of the Environmental Protection Act 1990 at Ammanford Magistrates Court. The prosecution was brought by Carmarthenshire County Council. The court heard that the council’s environmental enforcement officers were on patrol in Merlin’s Walk in Carmarthen town centre when they saw a woman throw a cigarette end onto the pavement. The officers approached the woman and explained what they had seen and that it was an offence to throw litter. She was issued with a with a fixed penalty notice of £75, however she failed to pay it and as a result was prosecuted through the magistrates court. Due to her limited means, Davies was fined £80 by magistrates and ordered to pay £50 towards prosecution costs. Water quality in the Burry Estuary is probably better than any time in living memory making it more attractive to aquatic and bird life, claim scientific experts. The irony is that misinformed protestors have been blaming water quality for cockle deaths when in fact it is parasites that specifically target cockles only that have been responsible. Scientists have been investigating the death of thousands of tonnes of cockles in the Burry Inlet since 2002 in an exercise that has cost more than £12million. They have found two parasites alien to the British coast are the likely cause. They are certain the cockle mortality has no link with water quality. The scientists are now focusing attention on the parasites which may be causing the shellfish to die prematurely. A final report into the deaths, which have hit the cockle industry off Gower and Llanelli, is expected in April. A Carmarthen man has been fined by the courts for dropping a cigarette end in the town centre. Anthony Mark Davies, aged 34, of Parc Bagnell, was convicted in his absence of an offence contrary to Section 87 of the Environmental Protection Act 1990 at Ammanford Magistrates Court. The court heard that the council’s environmental enforcement officers were on patrol in Carmarthen town centre when they saw a man throw down a cigarette end onto the ground near Debenhams in St Catherine’s Walk. The officers approached the man and explained what they had seen and that it was an offence to throw litter. Davies said that there were no bins in the area, however, there were two bins nearby which the officers pointed out. He was issued with a fixed penalty notice of £75, however he failed to pay it and as a result was prosecuted through the magistrates court. Davies was fined £175 and ordered to pay £100 towards prosecution costs. Taxi marshals will be helping rugby revellers in Llanelli to get home safely during this year’s Six Nations championship. The marshals will be based at Island Place between 11pm and 4am on Friday, February 4 and Saturday, March 19. The championship starts on Friday night with Wales V England at 7.45pm and finishes on March 19 with an afternoon of rugby starting with Scotland V Italy at 2.30pm, followed by Ireland V England at 5pm and finally France V Wales at 7.45pm. It is hoped the marshals, funded by the Community Safety Partnership, will help to cut anti-social behaviour and alcohol-related crime in the town centre as well as protect the public and reduce the fear of crime. In addition, there will be proactive, high-visibility policing and visits to licensed premises. A Llanelli man has been fined after his waste was found fly-tipped. Hilton Joe Morgan, aged 47, of Parc Morlais, Llangennech, pleaded guilty by post to an offence contrary to Section 34 of the Environment Protection Act 1990 at Ammanford Magistrates Court. The court heard that on Sunday, June 20 last year the council’s environmental enforcement officers were on duty at Swiss Valley in Llanelli where they saw a large amount of waste that had been tipped in a gateway to a field. The waste included a child's bike, household furniture, wood, rubble, carpet, underlay, bags of broken tiles, dismantled kitchen units, worktop, television, bathroom suite and cardboard packaging. The officers found evidence among the waste relating to an address in Felinfoel. Claims that the UK's Coalition Government wants an early end to direct payments to farmers following the reform of the Common Agricultural Policy (CAP) were "complete nonsense", Agriculture Minister Jim Paice has told a Farmers' Union of Wales lunch at the House of Lords. "There are some stories about that we want to see the end of direct payments, as if by tomorrow," Mr Paice said at the union's annual function to promote Welsh food during Farmhouse Breakfast Week. "That is complete nonsense and an absurd proposition. Farming couldn't survive without direct payments but we need to be more ambitious in the future and I hope that when we publish our proposals we will be suggesting a long, long transition from the current CAP system." A 24-hour event has been organised to encourage business to innovate, save money and help the environment. Project twenty 4, Wales’s first 24 hour sustainability and innovation event, will take place on Friday and Saturday February 18 and 19 at the Carmarthen Campus of the University of Wales Trinity Saint David. It has been sponsored by Menter Cwm Gwendraeth with support from its partners. Project twenty 4 'Changing Tomorrow – Today' will open with a schools and business innovation forum from 9am-1pm, followed by lunch with business leaders. Then from 2-6pm there will be a sustainability and innovation master class for business and the community followed by a networking supper from 6-7pm. A Llanelli man has been fined by the courts for throwing litter. Craig William Benjamin Palmer, aged 19, of Clifton Terrace, was convicted in his absence of an offence contrary to Section 87 of the Environment Protection Act 1990 at Ammanford Magistrates Court. The court heard that the council’s environmental enforcement officers were on patrol in the Vaughan Street area of Llanelli town centre when they saw a male drop and kick a crumpled up paper bag, then walk away, leaving it on the ground. The officers approached the offender, who was with three other males, and explained what they had seen. However, the accused and his friends became abusive and obstructive towards the officers and refused to give his details. Palmer finally calmed down and gave his details, but due to his manner towards the officers, he was not offered the option of a fixed penalty notice but was prosecuted through the court instead. The owners of a Llandovery supermarket have been fined £300 and ordered to pay court costs of £100 for failing to store its waste correctly. Bilal Tiktiklar, aged 29, and Mehmet Cirpan, aged 32, who run Costcutters in High Street, Llandovery, pleaded guilty at Ammanford Magistrates Court to an offence contrary to Section 47 of the Environmental Protection Act 1990. The court heard that on Wednesday, June 30, the council’s environmental enforcement officers were on duty in Llandovery when they saw a trade waste bin belonging to Costcutters overflowing with waste as well as waste stacked at the side of the bin. The officers had had previous dealings with the owners regarding their business waste and had given them warnings and issued a fixed penalty notice for £100 in the past. As the owners had continued to flout the legislation, the council had no choice but to prosecute them through the magistrates court. A Gwendraeth Valley man has been fined £100 and ordered to pay £50 court costs for throwing litter. Eifion John Lloyd Evans, aged 18, of Plasbach, Llangyndeyrn, Kidwelly, pleaded guilty by post to an offence contrary to Section 87 Environmental Protection Act 1990 at Ammanford Magistrates Court. The court heard that the council’s environmental enforcement officers were on duty at Rhosmaen Street in Llandeilo when they saw a young male walk across CK’s supermarket car park and drop a crumpled up wrapper onto the ground. The officers approached the man and explained what they had seen. However, he denied dropping the item and became quite arrogant in his manner. As a result, he was not offered the option of a fixed penalty notice but was prosecuted through the court instead. The council now hopes this latest case will act as a warning to would-be litterbugs in the county that if they flout the law they will be prosecuted. A Llanelli woman has been fined by the courts for putting her rubbish out on the wrong day and not recycling. Victoria Elizabeth Goddard, aged 35, of Stanley Road, pleaded guilty by post to an offence contrary to Section 33 of the Environmental Protection Act 1990 at Ammanford Magistrates Court. The court heard that the council’s environmental enforcement officers had already issued a warning to Goddard in March 2010 before issuing a fixed penalty notice for £100 in August last year – which she failed to pay. Officers found five bags of rubbish to the rear of the property and they stayed there for two weeks. She was fined £100 by magistrates and ordered to pay £50 towards prosecution costs. It is now hoped this fine will act as a warning to other residents. Members of Carmarthen Town AFC will receive reports on the work of the club’s Community Programme and efforts to secure new sponsorship cash at the Extraordinary General Meeting at the clubhouse on Friday night. The meeting, which starts at 7.30pm, has been convened to select a new club president to replace Anthony Jenkins, who has stepped down after many loyal years service. “While that is the main item of business on the agenda, we will take the opportunity to bring members of the club up to speed with the work of the club’s Executive Committee,” said chairman Gareth Jones. The meeting is open to Gold Members, Vice Presidents and season ticket holders. Residents of the Gwendraeth Valley are being urged to come forward with ideas for how they would like Gwyl y Gwendraeth to develop. Organisers Menter Cwm Gwendraeth want to revamp the festival and are keen to hear from local people who can bring their skills and new ideas to the task. Gwyl y Gwendraeth is held throughout the valley over the course of May and features events that are aimed at bringing local community groups of all ages together to celebrate the modern and traditional culture of Wales. Events at previous festivals have included treasure hunts, sports activities, quizzes, concerts and a Youth Amateur Dramatic Production “Taro Tant”. Gwyl y Gwendraeth attracts about 5,000 people. Menter Cwm Gwendraeth community development officer Aled Vaughan Owen said: “We are looking for ideas from the people of the valley as to how they would like to celebrate the festival. Green-fingered children living on an Ammanford housing estate have rolled up their sleeves to create a vibrant community garden. The children, who live in Heol Hayden, are working on a fruit, vegetable and herb garden to improve their estate and create a project which will bring all ages of the community together. The project is being funded by the council’s Environmental Works Project and WAG’s Tidy Towns, each contributing to the £8,528 total cost. Children have been involved with the design of the garden, and have also carried out litter picks to prepare the site ahead of the work. They have been helped by the council’s Future Jobs Fund employees. One of the children, Shaun Gladman, said: “The fruit and vegetable garden will help us get more active and teach us new skills. It will be nice for everyone to do something together and for us to have something to do. Without the Environmental Works Project we would never have had the idea to improve our estate. 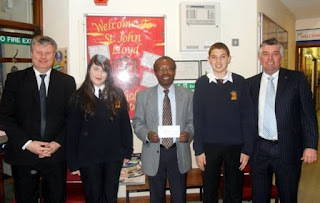 Nice story about St John Lloyd School raising £1000 for Llanelli Rotary Club's HARK appeal in the Llanelli Star today. Splendid feature on Llanelli Rotary Club's annual Youth Speaks competition in the Llanelli Star today. Nice Jenkins Bakery (conference visit on 90th anniversary) pic and story in the Llanelli Star today. Cor Meibion Llanelli's new waistcoats - pic and story in the Llanelli Star today. 'View from Richmond Park' Carmarthen Town AFC column in the Carmarthen Journal today. Story on another first for Carmarthen Mayor's races (wheelchair event) in the Carmarthen Journal today. Spotlight on the Healing The Wounds charity in the Carmarthen Journal today. Jenkins Bakery of Llanelli featured in the latest issue of Swansea Bay Business Life magazine. Clay Shaw Butler's Nigel Roberts featured in latest issue of Swansea Bay Business Life. Stagecoach Carmarthen theatre arts scholarships featured in the Western Mail arts pages on Saturday. Llanelli audiences will have the exciting opportunity to hear one of the world’s greatest choral works when Haydn’s choral masterpiece “The Creation” comes to Llanelli. In the beautiful surroundings of All Saints Church Llanelli, the mighty choral force of the Llanelli Choral Society will perform The Creation – Die Schöpfung – considered by many to be one of the world’s great choral masterpieces which depicts and celebrates the creation of the world as described in the biblical book of Genesis and Milton’s Paradise Lost. 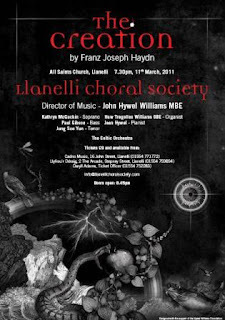 The landmark work will be under the direction of conductor John Hywel Williams MBE who will unite the mass voices of the Llanelli Choral Society, acclaimed singers – soprano Kathryn McGuckin, bass Paul Gibson, tenor Jung Soo Yun with accompaniment by The Celtic Orchestra, organist Huw Tregelles Williams OBE and pianist Jean Hywel. “The Creation is a wonderful work for both audiences and performers alike”, explains maestro John Hywel Williams. The chief of the Healing The Wounds charity has criticised the Welsh Assembly Government and Health Minister Edwina Hart for snubbing the fund-raisers. The Executive Director of Healing the Wounds, the charity that is working to help Armed Forces Personnel, Veterans and their families in Wales, said he was desperately unhappy about the response of the WAG. “We have requested meetings with Health Minister Edwina Hart, but she has declined to speak to the charity,” said Kevin Richards. The charity is still looking for suitable premises for a Welsh convalescent home and treatment facility for victims of PTSD (post traumatic stress disorder). Last week, the charity announced it had been forced to drop its plans to site a home at the historic Golden Grove Mansion House in the Tywi Valley. A high quality office development on the edge of Llanelli town centre has been officially opened and described as an important asset for the business community and a boost for the local economy. Carmarthenshire County Council leader Cllr Meryl Gravell said that the £1million West End Yard development would help meet the local demand for modern high specification office accommodation and would greatly contribute to the work currently underway to regenerate Llanelli town centre. The suite of six offices, developed by the Means Renewal Limited, a company set up by two local businessmen Peter Williams and Paul Silcox, was supported by a Property Development Grant from Carmarthenshire County Council and the Welsh Assembly Government. Deputy First Minister Ieuan Wyn Jones said the importance of modern sustainable infrastructure to underpin economic growth was one of the key features in the Assembly Government’s Economic Renewal programme. People are being asked to help provide a vital winter food source for one of Carmarthenshire’s rarest breeding birds. Volunteers are needed to feed the tree sparrows to help them through the winter season when food is scarce. The tree sparrow may be mistaken for its more common cousin the house sparrow (tree sparrows have a distinctive brown cap and black spot on their cheeks). The birds are rare, but the Tywi Valley is now host to the largest population in Wales of this ‘red-listed’ species. Funding from the Countryside Council for Wales is helping volunteers, via the Carmarthenshire Biodiversity Partnership, to provide food. Volunteers in the Tywi Valley have been helping out by feeding the birds each winter – vitally important to help the birds through this hard season. The tree sparrows do not wander far from the valley floodplain. In the still or slow-flowing water found on the floodplain they can find the preferred insects that adults feed to the young during the summer. All Carmarthenshire library members can now enjoy a free internet Newsbank service. Newsbank contains thousands of full-text articles from more than 20 Welsh, and over 350 UK daily and weekly newspapers. Daily updates mean that current news and archived articles can be used to track subjects historically. It also provides millions of current and archived newspaper articles that researchers can use to pinpoint sources, compare perspectives and track subjects historically and geographically. Users can quickly and easily search either a single Welsh newspaper or Welsh and UK titles simultaneously. To access Newsbank, people only need their library card number. Education executive board member Cllr Gwynne Wooldridge said: “This is an excellent new service which is now available to all library members. TV weatherman Derek Brockway is challenging people to try something new at their local library during the Welsh libraries festival. Until January 30, a range of events for all ages will be happening in libraries across Wales. In Carmarthenshire, libraries are offering people the opportunity to work on their family history with the assistance of an experienced researcher. Sessions will be approximately 45 minutes each and booking is essential. Weatherman Derek said: “I’ve been set a challenge to try something new at different libraries across Wales. During the festival I will be shown survival techniques with expert Andrew Price in Monmouth. People interested in their family histories can get help from experienced researchers at libraries in Carmarthenshire. Sessions of around 45 minutes each are available at the libraries in Llandeilo, Carmarthen and Llanelli, taking place this week. Anyone wanting to take advantage of the free service, being provided through the Fancy That Libraries Festival, needs to book a slot. Researcher Greg Howes will be in Llandeilo on Tuesday, January 25, from 1.30pm to 4.30pm; and in Carmarthen on Thursday, January 27 from 10am to 1pm and 2pm to 4.30pm. Gloria Letten will be providing the service in Llanelli on Wednesday, January 26, and Friday, January 28, from 10am to 1pm and 2pm to 4.30pm on both days. Contact the libraries or email Myrddin Morgan at Mymorgan@carmarthenshire.gov.uk to book a slot. Ammanford Library's Friday storytime sessions for pre-school children have restarted after the Christmas break. The sessions, which are term-time only, will now start a little earlier at 1.30 (until 2.15). Carmarthenshire's gypsy and traveller communities have a few weeks left to respond to the consultation on a new strategy aimed at improving the council’s response to their needs. A Gypsy and Traveller Community Strategy has been put together to ensure better support for their education, health and social care needs, and to ensure improved access to accommodation. The local gypsy and traveller community, together with partner agencies such as Education and Planning, and Elected Members, have been involved throughout the process. Residents at the council-owned Penybryn site at Bynea, Llanelli, private sites and the Westover site in Whitland were interviewed about their needs, health and education. Having a fully-informed strategy in place will mean officers can have a proper understanding of the movements, encampments and lifestyles of the communities so they can plan for their housing, education and health needs. Aa part of National Storytelling Week, one of the UK’s leading contemporary storytellers will be at the Carmarthenshire Centre for Crafts, St Clears. Renowned bilingual storyteller Michael Harvey can usually be found at major international festivals in Britain, Europe and North America telling traditional stories from the Celtic countries and beyond. He will be in St Clear’s on Thursday, February 3rd, undertaking storytelling workshops with pupils from Ysgol Griffith Jones and Tavernspite CP School. To find out more about similar workshops and what's in store for the February half term week, visit www.carmarthenshirecentreforcrafts.co.uk or call 01994) 232 726. The Carmarthenshire Centre for Crafts also has a series of February half- term Craft for Kids workshops that are planned to keep all ages busy. Carmarthenshire signs boost for toads! New road signs are being spawned in Burry Port and Ammanford. Carmarthenshire County Council is putting up toad crossing warning signs at Burry Port and Pantyffynnon. These have been mainly funded by the council with a grant contribution from the Countryside Council for Wales to provide biodiversity projects. The sites have been registered with Froglife as part of their Toads on the Roads scheme where significant migration sites are recorded and with the signs erected to warn motorists during the toad migration season. Currently both sites have volunteers who collect the toads in buckets to help them across the busy roads which bisect toad migration routes to breeding ponds. The toad crossings will feature on Google Earth in a bid to cut the numbers of amphibians being croaked by motorists. Toad numbers have declined in many parts of UK and road kill is thought to be the principal cause coupled with the loss of ponds. Budding young entrepreneurs living in rural parts of Carmarthenshire have pitched their ideas in front of a panel of local business leaders in an exciting competition called Cwtsh y Ddraig. The Cyf.le Cwtsh y Ddraig competition final was held in the Llwyfan Arts Centre in Carmarthen along with a business networking evening. Six finalists were given 10 minutes to convince the business dragons to part with their cash to invest in their businesses, in a similar way to the TV series Dragon’s Den. Local businesses put their hands into their pockets to sponsor the £900 prize fund. The winner Shelley Williams, of Vintage Tea Party Experience, won £500 to invest in her business which will provide the experience of a traditional tea party for weddings and other special occasions. Garnant Golf Club is to be re-tendered for sale after the last round of tenders sent out over the end of last year failed. A total of 12 tenders packs were sent out in November last year to interested private owners and enquiries were received from 10 others seeking to take over the Ammanford £1-million municipal golf course to help secure its long-term future. Only two former tenders were received and owners Carmarthenshire Council said they were unable to offer a lease to either of the bidders. One of the tenders failed to meet the evaluation and financial criteria and the other did not provide value for money for the Council. The Council wants to lease out Parc Garnant - built on reclaimed land from a former open cast coal site - which will make a loss of around £150,000 this year. Local food, glorious food takes centre stage at the National Botanic Garden of Wales on January 29 & 30. A mouth-watering array of produce will be on display to try, taste and buy in the stunning surrounds of the Great Glasshouse. There will be stalls selling Welsh Black beef and beer; soups, sweets and smoked meats; bread and cheese; pastries, pies and pickles; cakes and Celtic wine. The Food Fair is on both Saturday and Sunday (Jan 29 and 30) and is open from 10am until 4pm both days. Professor April McMahon has been appointed Vice-Chancellor of Aberystwyth University. Professor McMahon is currently Vice Principal Planning, Resources & Research Policy at Edinburgh University. She will take over from Professor Noel Lloyd on the 1st of August 2011. A native of the Scottish Borders and Scots speaker, Professor McMahon gained an MA in English Language and Linguistics followed by a PhD in English Language at Edinburgh University. For 12 years she taught at the Department of Linguistics at Cambridge University, where she was also a Fellow of Selwyn College, and was Professor of English Language and Linguistics at the University of Sheffield from 2000 until 2004. In 2005 Professor McMahon returned to Edinburgh University as Forbes Professor of English Language and Head of the Department of Linguistics and English Language. She was subsequently appointed Head of the College of Humanities and Social Science and took up her current role as Vice Principal in September 2009. Carmarthen racehorse trainer Alison Thorpe sends Diktalina to compete in the 4.10 race at Leicester today. Fund-raising to complete the Carmarthen Town AFC Club Community Centre continues at a pace as the date is set for the first lunch at the prestigious new Richmond Park facility. The centre already looks complete, but external work and internal furnishings are required to complete the project. The principal guest speaker at the lunch (to be held on Friday, February 25, 12.45pm for 1.15pm)will be Robert Croft, the England and Glamorgan cricketer. The event will mark a presentation from the club in recognition of reaching the cricketing milestone of 10,000 runs and 1,000 wickets, the only Welshman to do so. Robert is also an accomplished after dinner speaker and Sky Sports pundit. There will also be another accomplished guest speaker - confirmation of his attendance will follow in the near future. Other guests include the actor Dafydd Hywel, who will pay tribute to Robert, and the television football broadcaster Dylan Ebenezer, who will speak briefly of his experiences. Cash boost for Llanelli Rotary international project: Pupils at St John Lloyd School, Llanelli, staged different fund-raising events to raise a total of £1000 for Llanelli Rotary Club's HARK appeal for a mobile audiology unit for Accra in Ghana. Pictured are, left to right, Headteacher Paul White; Rhiannon Thomas, Year 10; Rotarian Ken Abban, chairman of Llanelli Rotary Club's international committee; Connor Charles, Year 10; and Rotarian Anthony Jones, secretary of Llanelli Rotary Club. The HARK appeal will help station a customised Land Rover in Accra. The Land Rover will carry mobile equipment designed to tackle deafness and hearing issues in Accra. Members of Carmarthen Town AFC will be holding an Extraordinary General Meeting at the clubhouse. The meeting, on Friday, January 28, will see the selection of a new club president to replace Anthony Jenkins, who has stepped down after many loyal years service. The meeting will also discuss other proposed changes to the Executive Committee of the club. Tote draw – January 11, winning numbers 16 and 42. The prize was £200, but there was no winner. The weekly draw (for a prize of £300) was taking place on Tuesday evening. Fans will be interested to know the club has a web shop under the ‘Buy At’ banner.